This recipe is very celebratory! 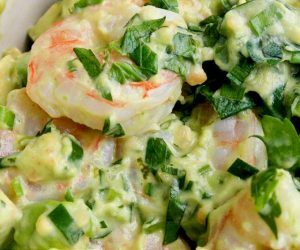 It combines pink shrimp, greenish avocado, fresh ginger and lime — the right colors for a holiday party. My friend, who tested this with me named it. She tasted and said, “It’s a Noel!” Whatever you call it, it’s delicious! It takes just 30 minutes to make. In a medium saucepan over a high heat bring the water to boiling with the 2 teaspoons of dried basil, the onion, and the salt. 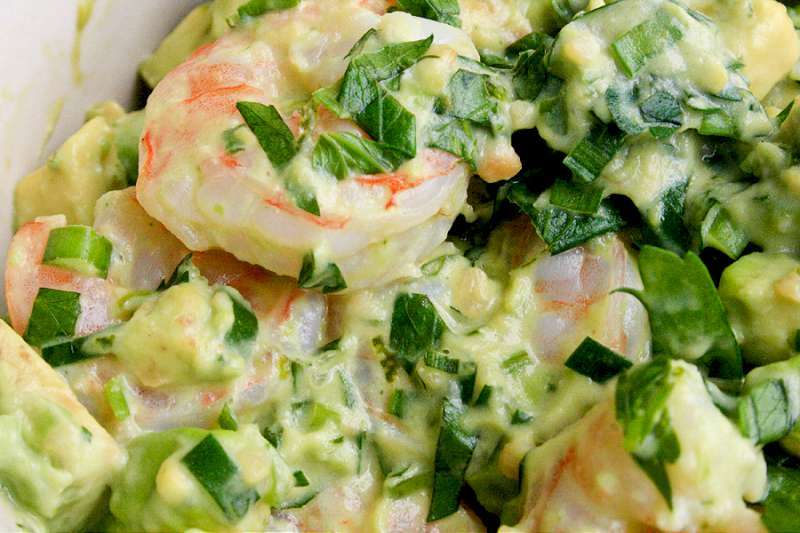 Boil 4 minutes, then throw in the shrimp. When the water comes back to a boil cook the shrimp 3 minutes. Drain and set aside until cool enough to handle. Meanwhile, in a medium bowl combine the Aioli, grated ginger, lime juice, the 1/4 teaspoon basil, the parsley, salt and pepper. Blend on high with until fairly smooth. Peel and chop the shrimp. Add to the Aioli mixture along with the avocado, and the pimento, salt and pepper. Cover and refrigerate until ready to serve. Garnish with parsley springs and serve with Stoned Wheat Thins or crackers.